I always forget how easy soups are to make. 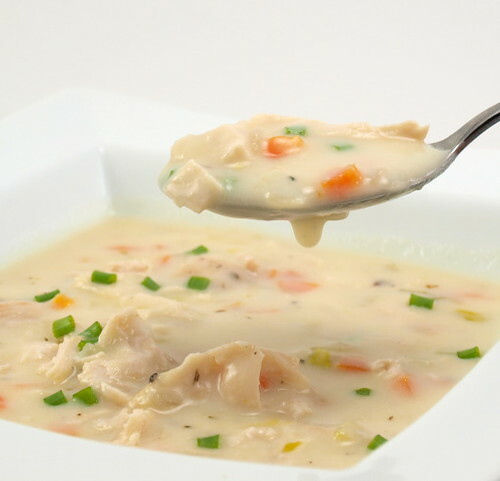 One of my favorite soups is cream of chicken. 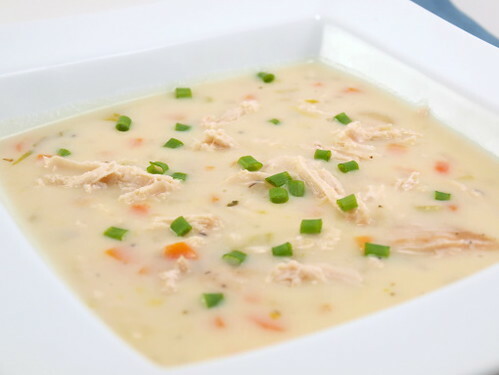 For the longest time I would buy the soup from the deli of the grocery store because I quite simply never thought to make it myself. I am kicking myself about it now because not only is it dead simple, it tastes far better than anything I have purchased. 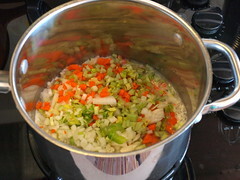 What I like is that I control the content of the soup, so if I want more carrots or more celery I am free to add it. 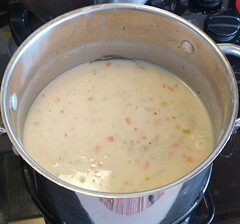 Speaking of additions, you can add more actual cream to this soup if you want to, as much as 1/2 cup. I used two tablespoons because I wanted it a little lighter, and a little cream goes a long way here. 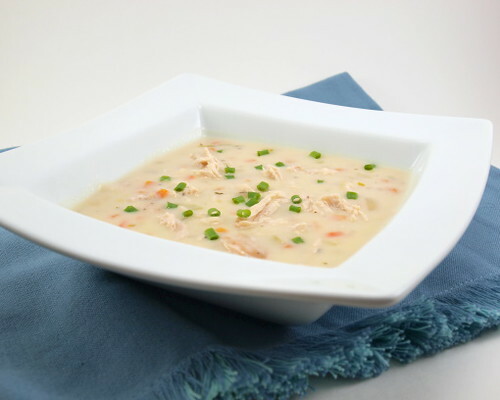 The whole dish takes less than an hour to make, and it keeps well in the fridge. If anything, it tastes better the second day. Heat the oven to 425 F and line a making sheet with foil and spray with non-stick cooking spray. 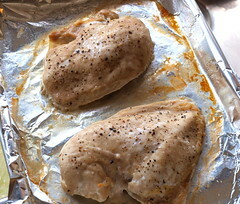 Season the chicken breasts on both sides with salt and pepper. 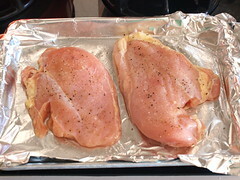 Place on the prepared baking sheet and roast in the oven until the chicken reaches an internal temperature of 160 F in the thickest part of the breast. Allow to rest for at least ten minutes before shredding. 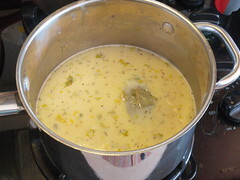 In a medium pot, over medium heat, melt the butter until it begins to foam. 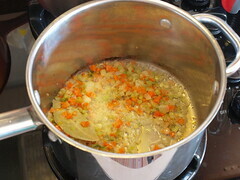 Add the carrots, celery, and onion and cook until they begin to soften, about three minutes. 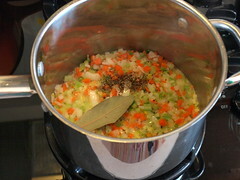 Add the bay leaf and the thyme and cook until the vegetables are soft, about six minutes more. 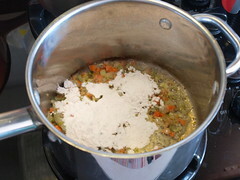 Add the flour and cook for two minutes, making sure that the flour is completely coated in the butter. 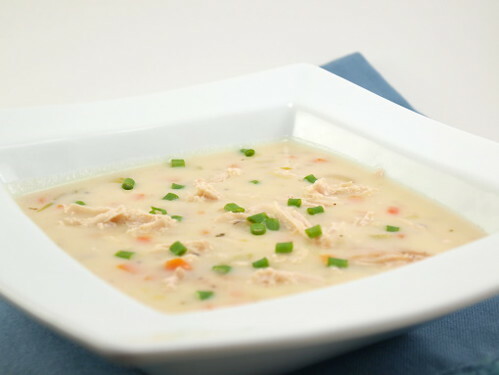 Whisk in the chicken stock and milk then reduce the heat to medium low and cook, stirring often, until the soup thickens and begins to simmer, about twenty minutes. 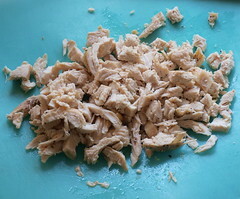 Add the shredded chicken and cook for three minutes. Remove the bay leaf and turn the heat down to low. Stir in the cream. Garnish the soup with some fresh chives.